​Please fill out our form then click submit. Thank You! Please give us a call at 540-868-1001 to schedule an appointment once this information is completed. Thank you! If you are bringing additional pets, we will take their information over the phone while making your appointment. Thank you! 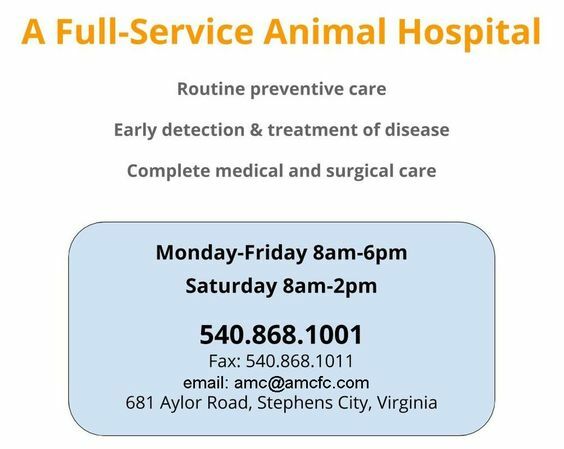 The Animal Medical Center of Frederick County, P.C. is regularly staffed Monday through Friday from 8 AM until 6 PM and on Saturday from 8 AM until 2 PM. All fees are due when services are rendered. The hospital accepts American Express, Visa, MasterCard, Discover and Care Credit in addition to cash and checks(if Driver's License number is provided). Deposits may be required for major medical/surgical cases, or trauma and emergency work where hospitalization is required. All services must be paid in full before the animal can be released. I will be responsible for all collection, returned check, court and/or attorney fees (33.3%), which may occur in the collection of this account if I default on this payment agreement. I also understand that interest charges of 2% per month (24% annually) and a $2.00 service charge will be applied to balances over 30 days. I certify that I am at least 18 years of age, authorized and duly capable to verify information about this patient and authorize treatment of this patient. Our hospital policy asks that you give us a 24-hour notice before canceling appointments. By not giving us sufficient notice, it hinders our ability to see other patients that may need medical care. Your account will be charged an appropriate office fee if this should occur. Due to the increase in medication requests we ask that you allow 24-48 hours for any refills that are needed. Thank you!